In any case, this is a post about craft … so back to the shirts. What do you do with all these shirts when they are too grotty to pass on to someone else? My sons shirts were quite revolting at the end of last year. They were hand-me downs to begin with, and then he wore them for another three years. The yellow shirt, in particular, becomes very grimy and grey. I love yellow day at the beginning of the year, everyone is sparkling in their brand new yellow t-shirts, but at the end of the year Wednesdays start looking a little dull! I had enough rags at home, and I didn’t want to throw them away … so I knitted them. 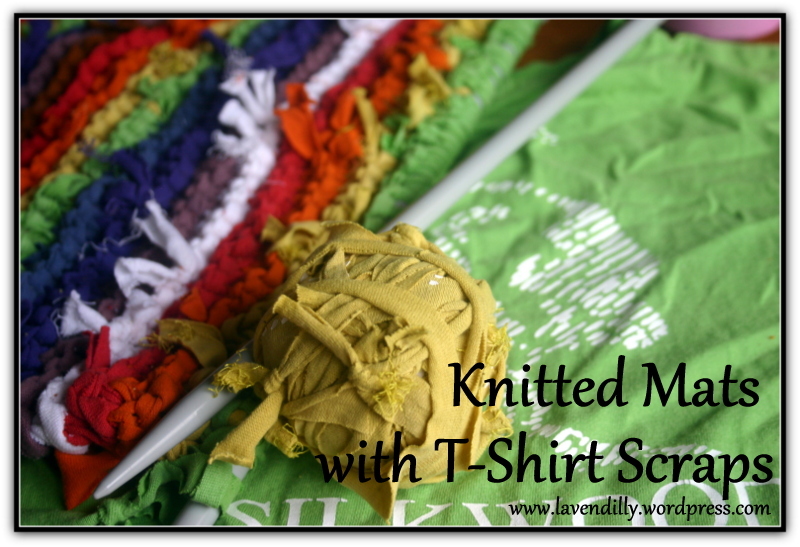 I cut his t-shirts into long strips and knitted them on chunky size 10 needles. 40 stitches across the needle in garter stitch. I had to knot the strips together where I cut over the seams, but I like the look of the knots in the knitting, it adds interest. They made a beautiful mat, soft to stand on, and so pretty. Even the yukky yellow turned up looking colourful again when it was knitted in with the other colours. I added a few more colours from my husband’s old shirts (yes, I did ask first!) and I had a whole rainbow. What I love most is that inside this mat are knitted some wonderful memories: my son’s first day of school, the friends who gave us the shirts in the first place, special new friends made, and wonderful memories of the time I taught at Silkwood too. There in my mat. I couldn’t throw those memories away. 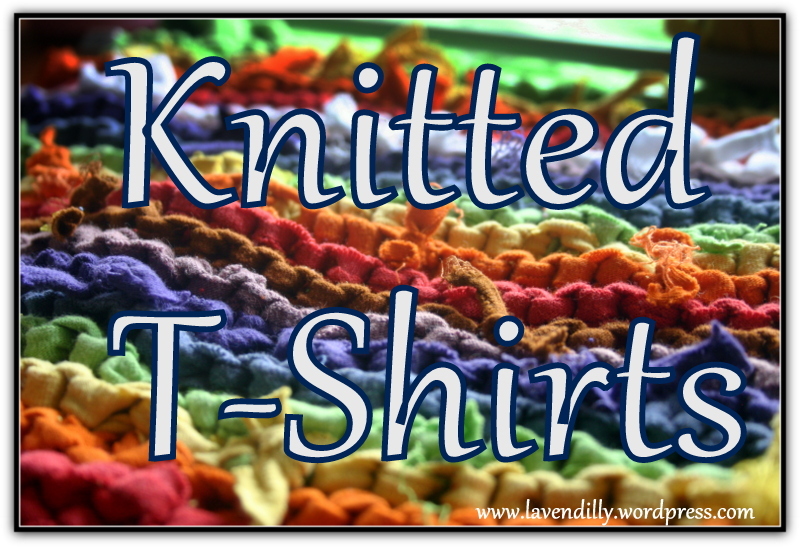 It was so quick, easy and satisfying to knit that I have no almost no t-shirts left in my drawer as I’ve started cutting them up for more mats …. Great blog Jen. 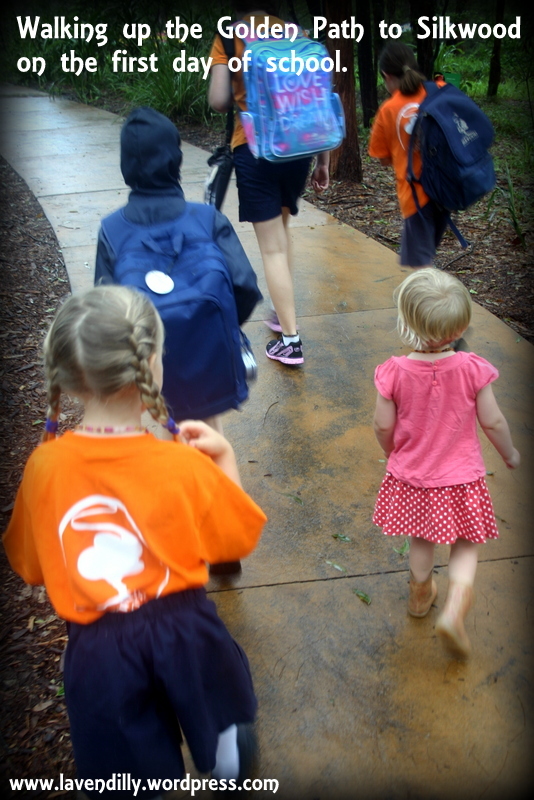 I love watching from playground duty the ‘odd’ shirts. If it’s my children I know it’s because I haven’t washed but I am always interested in why others have the ‘wrong’ shirt. It’s my entertainment for the morning. I would say it is usually laundry-related … it is for us! I love this. What a great school to have such a Magickal view of uniform. Thanks for sharing Jenn. Thanks Hollie! I am not sure that most of the school community knows about why the shirts are different colours, but that’s where it began, in any case 🙂 I like it and I am glad to have found a way to recycle the shirts when they are old and grotty too!